Robin began her journey with ADHD support and coaching as a Certified Parent Trainer for CHADD in 2008. At the time she worked full time in a corporate career with Procter & Gamble in Customer Business Development and Pharmaceuticals. 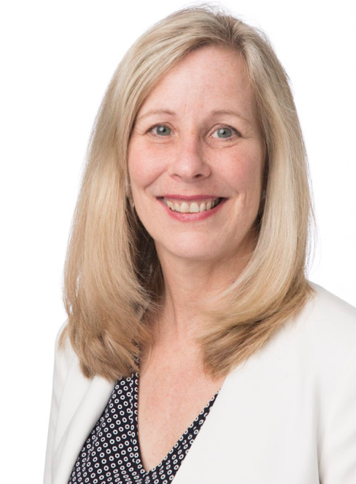 Her love of the job included the opportunity to identify and develop tools and resources to help with patient care and improving quality of life related to the company's product line. 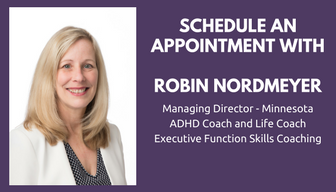 In 2010, Robin left her corporate role and trained with Adler Graduate School to become a Certified Life Coach and then completed MentorCoach's Advanced ADHD Coaching Program. She has completed additional ADHD Coach training classes through JST Coaching, Coach Approach for Organizers, ADHD Coaches Organization and CHADD International Conferences. She launched her coaching practice in 2011. Robin has presented at professional conferences, parenting workshops, podcasts and TV interviews on ADHD and related topics. Executive function skill building - To Plan & Prioritize, Manage Time, Work through Overwhelm & Procrastination, More Focus, Organization, Impulse Control and more. New Women's Small Group Coaching begins March 2018. This small group coaching opportunity is open to a small number of women who wish to be part of a collaborative group for added support and encouragement while working on their goals. Meets weekly in Edina, MN office at a time arranged by group. Three month minimum commitment. Individualized goals. Now enrolling! Send email to Robin@adhdcoach.life with interest. Click here to learn more about Robin. New to Coaching? Click here to schedule your Complimentary Get Acquainted Session. Ready to Begin Coaching? Click here to schedule your New Client Intake Session. Existing Clients? Click here to schedule your next coaching session. Robin meets with clients in her Apple Valley or Edina Office or virtually by computer or telephone. If you can't find a time that works or experience difficulties, please send an email for assistance to Robin@adhdcoach.life. Robin is available for brief phone calls and virtual check-ins. If you would like for her to call you during one of those times, click and complete the Open Office Hours Form. She will call you during the scheduled hour.